Phonological processing refers to the use of phonological information – particularly the sound structure of oral language – to process written language. Tasks of phonological processing are highly predictive of reading skills. The three types of phonological processing that appear specifically important to learning written language skills are phonological awareness, phonological memory and rapid naming. More and more speech-language pathologists are involved with teaching literacy. Reading is, after all, a language-based task. 2. vocabulary comprehension – understanding of word meanings. Spoken words are comprised of strings or sequences of phonemes that signal different meanings. Awareness that changes in these sequences result in changes in meaning is crucial in literacy skills development. Many years ago I became certified in a specific reading program that was being used in my district, and have worked with literacy instruction – especially with my more severely impaired communicators and AAC users – ever since. One fun activity I did in therapy revolved around adding, deleting, or changing a sound in a given word in order to make a new word. This takes kids beyond word families, where they simply swap out the initial sound to make new words; such as cat -> rat -> hat. 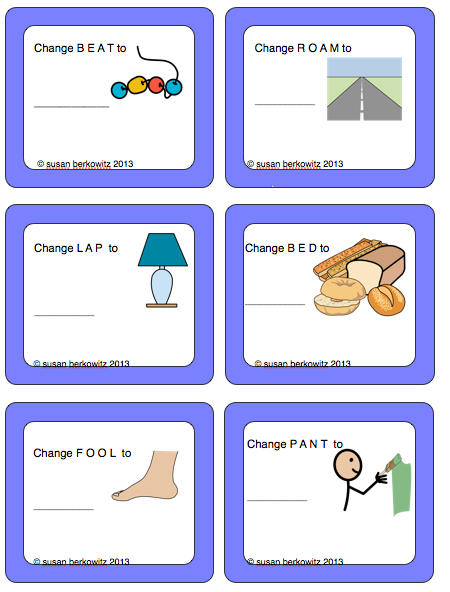 Sometimes we would see how far we could take the challenge of changing just one sound in a word to make a new word; such as hat -> hit -> bit -> bite -> kite -> kid -> lid -> did ->…. You get the idea. The kids always had a lot of fun with it, and nobody ever wanted to be the one who broke the chain. One great side effect of this activity was that the kids became better listeners. Focusing on hearing the words so that they could spell and change them made them listen more carefully to directions and brief explanations. In speech therapy, that’s a big bonus! Here is a sheet of sample cards to get you started. 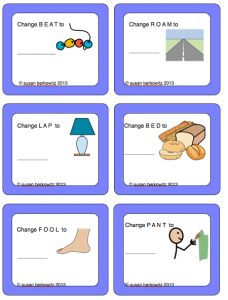 Have fun making your own – or let the kids come up with examples for each other! Have fun with words! And keep on talking. I love how you showed what to do with the sounds! Thanks for the freebie!